"Android camera." It doesn't even sound like a real thing. That's why the Samsung Galaxy Camera could easily have been a nonsense concept—two desirable things hurled together in hopes that the result will be a revolutionary hybrid, and not a catastrophe. But forget all that, because it's neither. Instead, the Galaxy Camera is a deftly conceived prototype of what connected cameras should be. The compulsive Instagrammer-Facebooker-Twitterer. Or the person who wants to take a decent photo and instantly send it to a friend. In other words, it's supposed to be a camera for everybody. From the back, the gorgeous 4.16-inch touchscreen could be a Samsung Galaxy S III. From the front, the lens and cozy grip could be the zoomy, wi-fi enabled Samsung WB850f. Sandwich them together, and you've got the Galaxy Camera. The Galaxy Camera feels big for a point-and-shoot camera—and big for a smartphone, too. The four-inch capacitvie touchscreen is a luxury on a camera, as is the instantaneous 4G connectivity. The Android OS is recognizable, and the apps work perfectly, whether shooting and sharing with Instagram or doing basic image editing in apps like Snapseed. When using a phone to take pictures, the ergonomics have always been a little off. The Galaxy Camera deals with this problem handily since, you know, it's an actual camera, complete with a shutter release and zoom on top. It operates like a mom-proof point-and-shoot in Auto and Smart modes; in Expert mode, a simple touch interface adjusts shutter speed, aperture, exposure compensation, and ISO. It's intuitive, although, it would be nice if the pop-out menu for adjusting these settings didn't take up the whole screen. A full-featured camera that's connected to the Internet is a joy to use. Apps like Instagram are not (and will never be) optimized to work with the Galaxy Camera's manual functionality and super long zoom. Well, the whole thing's pretty weird, really. Maybe the weirdest part is that we like it. A connected camera with Android OS makes sense. Camera makers have spent the last few years scrambling to compete with your smartphone camera's convenience by putting Wi-Fi into compact cameras. Until now, it's been poorly implemented. Using a general purpose GUI makes more sense than any of the proprietary solutions we've seen. Samsung's decision to go with such a long zoom is this camera's downfall. Yes, many people who shop for point-and-shoot cameras are very interested in zoom, but this makes the camera unwieldy. If, instead, Samsung had married the design of a GSIII with, say, the beautiful, slim design of its MV900F, the Galaxy Camera might've been an winner. People want their point-and-shoots tiny. Given the Galaxy Camera's image quality, it's expensive for $500—especially considering that you're also going to have to pay for a data plan. Yes, the camera takes much better photos than you average camera phone. Battery life is better, too—we got three days of moderate use off a single charge. But as a camera, it needs a larger image sensor to compete with the best point-and-shoots. In a comparison between the Galaxy Camera and the excellent Canon Powershot S110, at ISO 3200, the Galaxy Camera's photo is noiser and more distorted. Maybe, actually. For all its foibles, the Galaxy camera is a lot of fun to use. Maybe this thing's nothing more than a toy, but it's a really entertaining toy. People want to instantly share an image—they just don't want to sacrifice quality to do it. So we're looking forward to seeing a more refined version of this design. 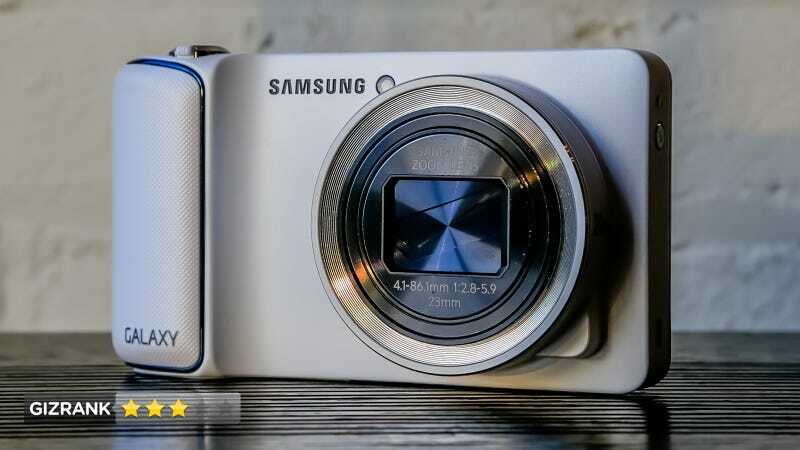 Hey, how about a Samsung Galaxy Camera Mark III?